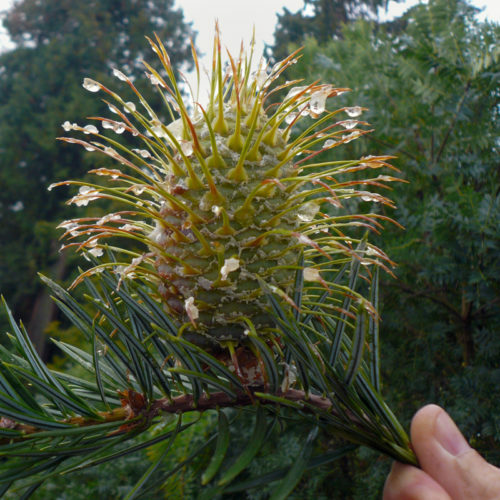 Abies bracteata, first described in 1845 by David Don (1799–1841) then later completed by Pierre Antoine Poiteau (1766–1854), is commonly known Santa Lucia, Bristlecone, or Silver fir; fringed spruce. Description. 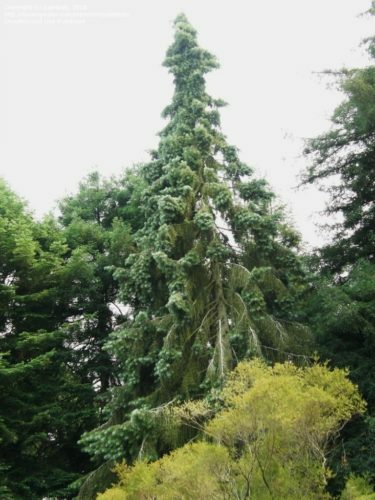 Santa Lucia fir is a tree that grows to a mature height of 65 to 110 feet (20 – 35 m), with a slender, spire-like structure. 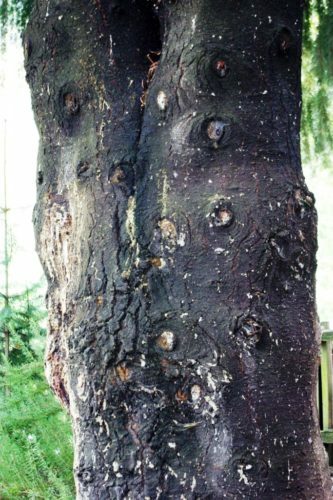 The bark is reddish-brown with wrinkles, lines and resin vesicles ('blisters'). The branches are down swept. 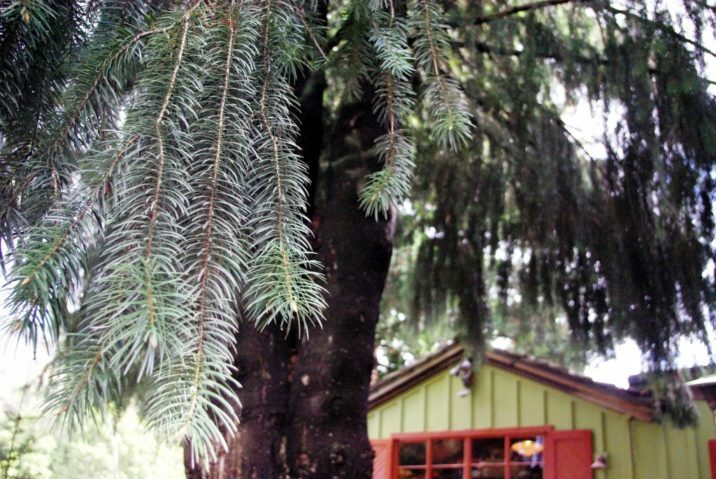 Its needles are among the longest and widest of all Abies, growing to 2 inches (5 cm) longs by 0.0125 inch (3.1 mm) wide. Buds are long and spindle-shaped. Toward the tree top it will create a lush spire of immense uniquely showy cones, 2 to 4 inches (5 - 10 cm) long, squat, green at first, then purplish-brown when mature, fringed with unique needle-like bracts or bristles to 2 inches (5 cm) long. 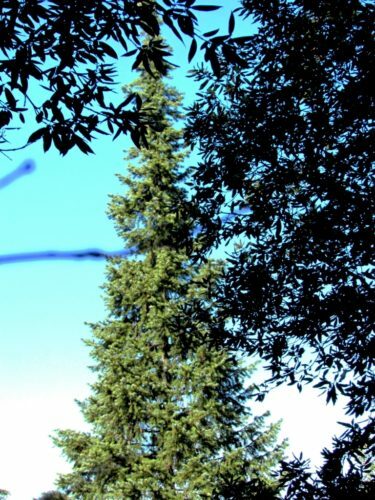 Exceptional trees of 182 by 13.5 feet (54.6 x 4 m) exist in Los Padres National Forest, CA (1976) and 122 x 15.5 feet (36.6 x 4.7 m) at Eastnor Castle, Herefordshire, England (1970). Distribution. This species is primarily limited to west coast cultivation, but even in California most specimens are young. Its natural range is a few isolated groves in the Santa Lucia mountains of Monterey and San Luis Obispo Counties in coastal California, on moist canyon bottoms. Abies bracteata -- natural range. Chris Earle relates many more interesting observations about this unique species in The Gymnosperm Database. "There has been considerable conjecture as to this tree once having a wider range. The fossil record attributed to this tree in the past, however, is a series of misidentifications, and no sound evidence exists for this tree in any fossil flora, excepting one possible needle and seed from western Nevada, and this is still under study by Dr. Axelrod at U.C. Davis. We have no idea as to when the fir arrived in the Santa Lucia Mountains or where it came from. As to why it is not found elsewhere in the West today we can ask ourselves: Where else can high equability, heavy winter rains with long dry summers, and large areas of fireproof topography be found. The answer is nowhere but the Santa Lucia Mountains for all of western North America" (Talley 1972). Abies bracteata — a closeup of a branch with cone. Spectacular! At UBC Campus, Vancouver, British Columbia, Canada. Santa Lucia fir at San Francisco Botanical Garden. Abies bracteata — at China Camp in the Santa Lucia Mountains, California. Abies bracteata — a closeup of the distinctive bark. Abies bracteata — a closeup of foliage.